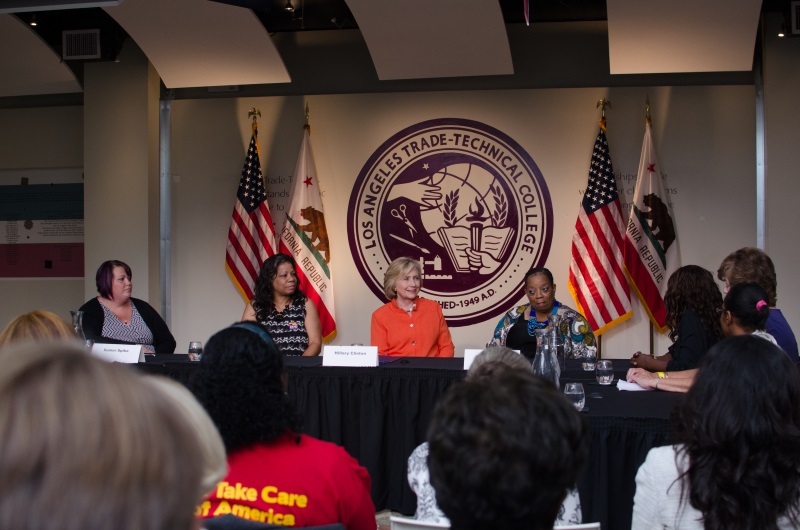 On August 6, Home care providers and consumers from across the country met with former Secretary of State and Democratic presidential candidate Hillary Clinton. The meeting included both union and non-union home care workers who focused on the need for quality long-term care and the difficulty in trying to make ends meet with the inconsistent hours and low wages many home care jobs provide. The meeting was a chance to showcase the work that home care providers do every day, often without a lot of acknowledgement. Some workers shared heartbreaking stories, while others shared how their work has improved and expanded into advocacy after they formed their union and fought for better care and working conditions for all. I love the job that I do, I’m very passionate about it. 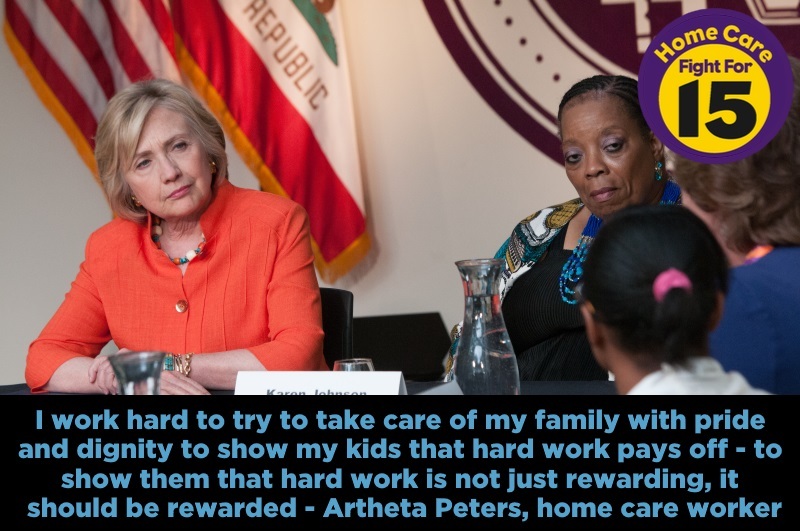 Home care workers don’t get the pay they deserve. I’ve been hurt on the job, with no worker compensation. We have no benefits, no vacation, no sick time. So what I’m asking is for you is to please stand by us, walk with us, and help us win a living wage. I have two consumers, one I get paid for, and one I volunteer to provide care for. In response, Secretary Clinton closed with words of encouragement and support. I think that this movement to give dignity and respect and better pay and benefits and training to home care workers is one of the most important missions that we should take on together. You are on the front lines and the rest of us have to be supporting you and advocating for you. Some 19 million seniors need long term care supports and services, and that number is set to nearly double by 2050. But only about 2 million people make up the workforce available to care for these older Americans — and the gap is growing. Are you a home care worker or supporter? Sigh the petition for $15.